WASHINGTON – There was an unmistakable somberness Tuesday morning at what should have been a joyful event. U.S. Reps. Will Hurd, R-Helotes, and Beto O'Rourke, D-El Paso, were at the National Press Club in downtown Washington to accept the Prize for Civility in Public Life, an award from Allegheny College in Pennsylvania. The two men earned the award after drawing national attention in 2017 for a road trip they took together from San Antonio to Washington, D.C., after flights were canceled due to an East Coast snow storm. The two livestreamed much of the trip, answering questions from the public along the way. But hanging over all of the praise for the two men as models of bipartisanship was Monday's Helsinki summit between U.S. President Donald Trump and Russian President Vladimir Putin, in which Trump sided with Putin against the U.S. intelligence community’s consensus that Russia interfered in the 2016 election. That event shook Washington and the political sphere in a way not seen since the president's incendiary reaction last year to a white supremacist gathering in Charlottesville, Virginia, that had resulted in the murder of a protestor. O'Rourke, like many of the 11 Texas Democrats in Congress, was quick to condemn Trump's performance in Helsinki. In contrast, a handful of the 27 Texas Republicans in Congress moderately criticized the president in news releases and in comments on Capitol Hill on Monday. But the vast majority of the GOP delegation have remained silent on Monday's events as of midday Tuesday. Hurd was an outlier, as he has long been within the Texas GOP delegation. The second-term congressman issued a litany of critical comments Monday against the president's public statements. "As a former CIA officer and a Congressman on the House Intelligence Committee, I can affirmatively say there is nothing about agreeing with a thug like Putin that puts America First," Hurd wrote in a series of Monday tweets. "The President is wrong. Russia interfered in the 2016 election and seeks to undermine our democracy"
At Tuesday's awards ceremony, both O'Rourke and one of the hosts of the event, former U.S. Secretary of Homeland Security Tom Ridge, a Republican, praised Hurd's comments. On Tuesday, Cruz spoke more at length to reporters, calling Trump's press conference "a mistake" but repeatedly comparing Trump's actions to what he called President Barack Obama's failure to prevent Russia's invasion of Crimea in 2014. Cruz sought to cast Democrats' reaction to Helsinki as hypocritical and dismissed their allegations of treason as overblown. "Treason is a grave crime punishable by death under U.S. law," Cruz said. 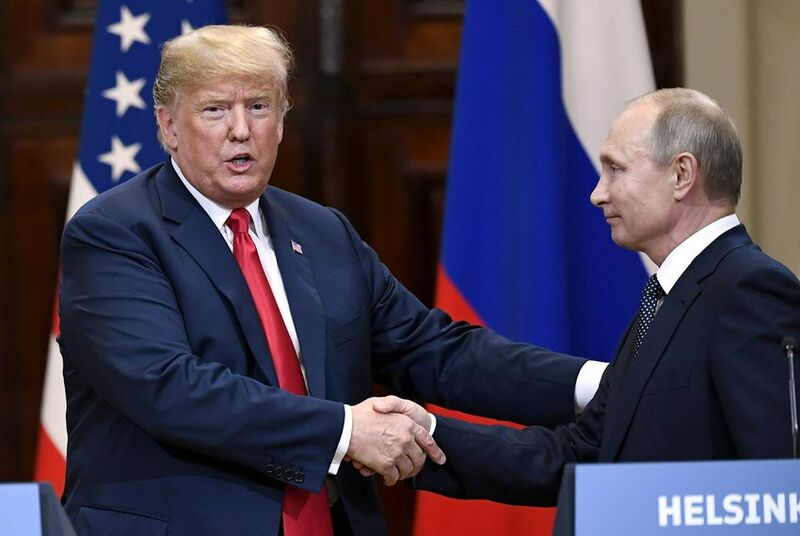 "And it wasn't treason when Barack Obama refused to stand up to our enemies ... and it wasn't treason when President Trump stood at a podium and failed to condemn Russian aggression and interference in our election." When asked by reporters if Cruz had spoken out strongly enough about Trump's actions, O'Rourke said, "No. This is a moment that you put your party, that you put your prospects on the next election, you put your career behind you and you put your country in front of you." "This is a moment at which each of us must stand up and be counted, and I heard my colleague, Congressman Hurd, loud and clear yesterday," he added. "I did not hear from our junior senator at all about the president's conduct." He went on to echo Republican U.S. Sen. John McCain's use of the word "disgraceful" in describing the president's behavior. "This is a moment that calls for unity and a nonpartisan response to a fundamental challenge to American security, to the integrity of our democracy and in our ability to move forward," O'Rourke added. O'Rourke further suggested that the events in Helsinki alone merited his vote for impeachment, though he has in the past he would support Trump's impeachment. "In standing on that stage, in another country, with the leader of a country who wants to — and has sought to — undermine this country, and to side with him over the United States, if I were asked to vote on this, I would vote to impeach the president," O'Rourke said. He went on to describe the Senate's role in the removal process of a president — a trial and examination of evidence — which comes after the House approves an article of impeachment. "Impeachment, much like an indictment, shows that there is enough there for the case to proceed," O'Rourke said. "At this point, there is certainly enough there for the case to proceed." Later in the day, Democrats on the House Intelligence Committee held a news conference to urge Republicans to take action against the president. U.S. Rep. Joaquin Castro, a San Antonio Democrat and the lone Texas Democrat on the committee, said lawmakers need to look past November. "There isn't a single person whose personal career and political career is more important right now than standing up to a president who won't stand up for America," he said.